Clinical experiences should be educational for the PA student and should not be called upon or used to substitute for regular staff. The following are some “guidelines” regarding what a PA student may be permitted to do by the preceptor. The judgment of the preceptor regarding how much responsibility a student is ready to assume should be the determining factor of which tasks are assigned and how much supervision is needed. All students should exhibit a baseline of medical knowledge and clinical skills. 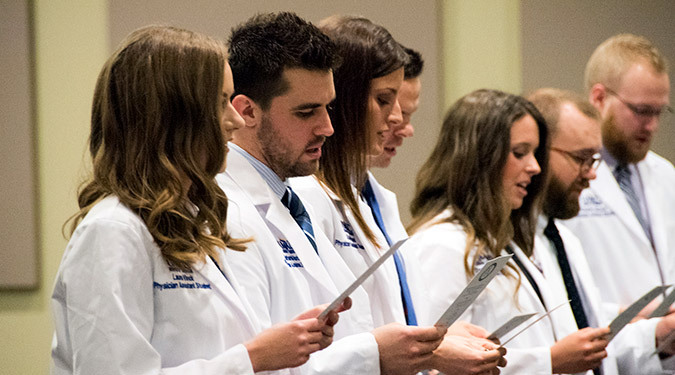 All students who have matriculated onto the clinical year have completed 15 months of didactic classes in preparation of their clinical year. A course syllabus will be provided to the preceptor outlining the rotation objectives the student must meet. UMKC PA students undergo extensive health screening and compliance training to maintain state and federal guidelines. This includes HIPAA training, EMR training, immunization verification, current annual TB test, drug screen and recent background check. These documents will be made available to the preceptor site once student placement has been confirmed.